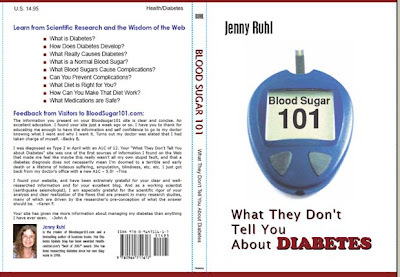 Diabetes Update: Blood Sugar 101: The Book! Sounds great ... perhaps your next work can be on publishing!! Excellent! I'll be sure to buy a copy for my own bookshelf, but also one to loan/give. I think you have the most comprehensive and accurate information about blood sugar out there, and it will be very useful to have access to it without a computer. Yes, I just saw them too! They're gone. Fantastic!! You have so much information!! I'll be ordering a book for my sister, that's for sure! Great idea - I will buy the book. Will you still have the 101 website available for free? The Blood Sugar 101 web site will ALWAYS be available for free. My whole purpose is to get the information out there that can help people and the web site does that very well. Oh, cool! I love your site, but it's difficult reading it in the bath... How available is the book likely to be outside the US? The distribution via online bookstores will be U.S. only, at least to start with. If there is strong demand I can eventually get UK distribution via the distributor I'll be using. But to start with I'll be offering the book on my web site with an option for international shipping. I'm being very modest in my expectations. I've sold enough books in the past to know how difficult it is to sell books. I'd be interested in your take on this. I was reading that they decided that gastric bypass cures diabetes because they are bypassing the part of the intestine that food stimulates GIP and GLP-1 in. That they are the cause of the hyperinsulinemia that leads to type 2 diabetes. I found this, that says they can inhibit the incretins and prevent diabetes from developing altogether. This seems to be the opposite of what Byetta and Januvia do. Why aren't they marketing this, (Pro(3))GIP, instead of cutting people up? Do you think there will someday be a drug on the market that completely prevents the development of most cases of type 2 in this way? The people selling surgeries can speculate all they want without having to back up their claims with peer-reviewed research. I don't think anyone really knows exactly why WLS can reverse diabetes. One thing we do know, is that people who have had WLS are forced to cut down dramatically on their carb intake. When you go from eating 400 grams of carb a day to eating 40, as many of us have learned you can normalize blood sugar very quickly and it has nothing to to with gut hormones. Since the medical establishment still is completely clueless about the impact of cutting carbs on what looks like very severe diabetes, they may not be making the connection. When I get emails from people who have lowered A1cs from 13% to 5% in 3 months just by cutting carbs, I have to wonder if it isn't that which is causing the improvement after WLS. Go look at the nutritional breakdown of what people at after WLS and you'll see what I mean. Reading the Back Across the Line blog has woken me up to the other things that WLS surgery does and how it not only kills a shocking number of people over the 5 years after "successful" surgeries, but leaves many others with permanent life-shortening malabsorption syndromes. You have a very good writing style. I am sure I too will enjoy your book. I am also a Type 2 Diabetic, now on Byetta 10 Mcg + Metformin 800 mgs and my Diabetologist is suggesting Januvia. I was looking for information on Januvia on the net and your site figured prominently in Google. Lot of information, unadulterated , direct and distinct. Thank you for the information and also for the tremendous effort taken by you to compile all this information.